Although this makes perfect sense, I suspect that most people (ourselves included) bypass this important step. The first time we painted our deck, we made the mistake of selecting a color that had too much red in it. That was mistake # 1. Mistake #2 was purchasing 2 gallons worth of that paint before getting a sample to test. We ultimately changed paint color but 2 years later, we had to paint our deck for the 2nd time. Would you believe we still didn’t get a small paint sample first? Fortunately, the color worked out. Perhaps we convinced ourselves that the new color will do. I’m happy to say that the 3rd time around, we wisely purchased a paint sample first. In fact, we purchased 2 sample cans of paint color we were mulling over (slate grey and chocolate brown). In the end, the chocolate brown won out. This is sort of a “half truth.” While kids can participate in painting, don’t expect more than 10 minutes before you realize what a mistake this happens to be. When I say kids, I’m referring to those younger than 6. There’s no doubt that if Ellie was the only child helping us paint, she probably would have been a great help to us. Our 3 year old, however, proved me right that while she means well, she was not going to be a careful painter. Once Lauren was done with the 1 wood post she was assigned to do, she promptly moved over to another section, unbeknownst to us. In doing so, she let her paint brush drip over a few of our pavers (thankfully paint came off). As soon as Chris noticed this, he quickly realized I was right all along. Must…abort…mission…now. Moral of the story: If your young kids insist on helping you paint, let them do it on an inconspicuous spot (we did) but make sure you supervise and know when their help is no longer needed. This usually won’t take more than 10 minutes. In our home, Sherwin Williams is the main brand of paint we use. Gone were the days that we used Behr, Home Depot’s main brand. Well, so we thought. After seeing a demo on Behr’s “Deck Over” line of paint, we decided to give it a try. Glad we did! I highly recommend this line of paint for wood decks. It coats the wood well and truly covers any cracks on the wood (see below photos). It provides a non-slip surface and gives the wood planks a composite-wood kind of feel. Although I loved the way the new brown color looked, I was still a little uneasy when both our outdoor decks were repainted. Was it too much brown? Should we have gone lighter? It took us over 15 hours (broken up into 2 days) to finish both decks (7 gallons of paint in total). Naturally, we were interrupted numerous times by our kids. 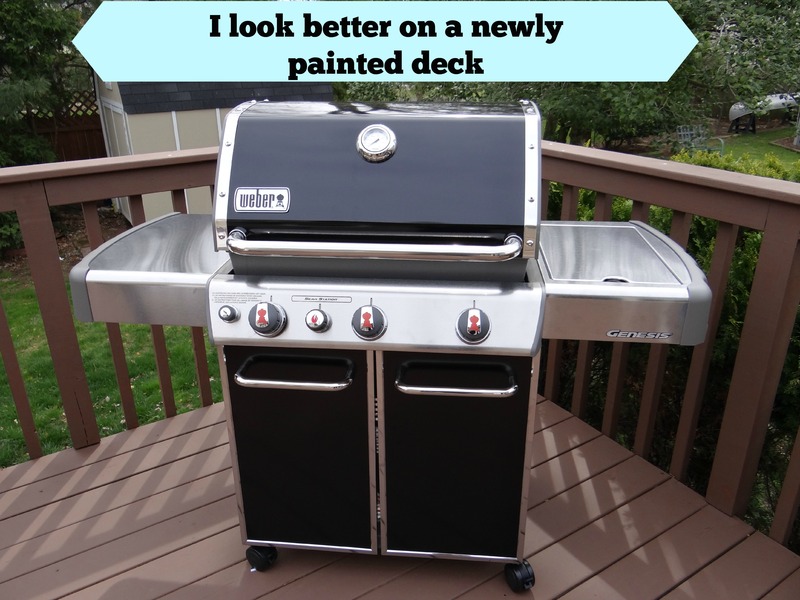 I knew it would take years before we would even consider repainting our decks. After giving it 3 days (staring at them every morn), I realized that the color was actually pretty fantastic. The shade of brown we chose wasn’t a dull brown. It was a rich, contemporary shade of chocolate brown. It complements the siding of our house as well as the grey pavers on our patio. Sure, Chris could have painted both decks himself (well, he did with the smaller pool deck) but working together as a team was reminiscent of our weekend warrior days, before the kids arrived. I painted the interior side spindles while he painted the exterior side spindles as well as larger surface areas. It would have taken him 2 days just to do the big deck on his own. It was definitely satisfying to see that after all these years operating under the mentality of “divide and conquer” on tasks, we were collaborating on a joint project. It was just like the old days, B.K. (before kids). 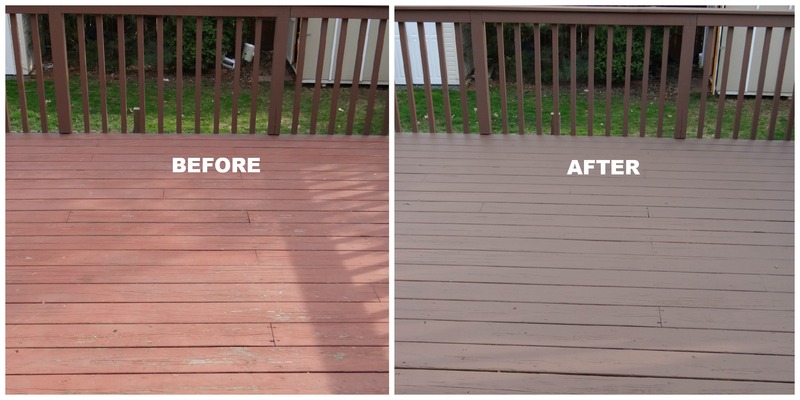 1) Our deck color before and after. 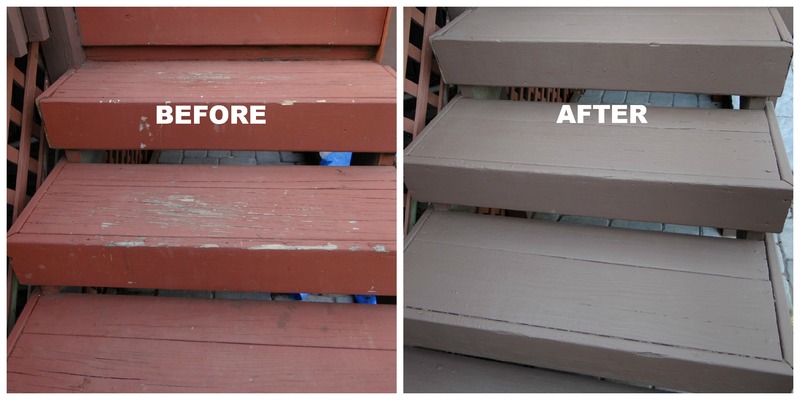 2) Look at how well the paint coated the deck stairs. They always take a beating from my dogs running up and down! 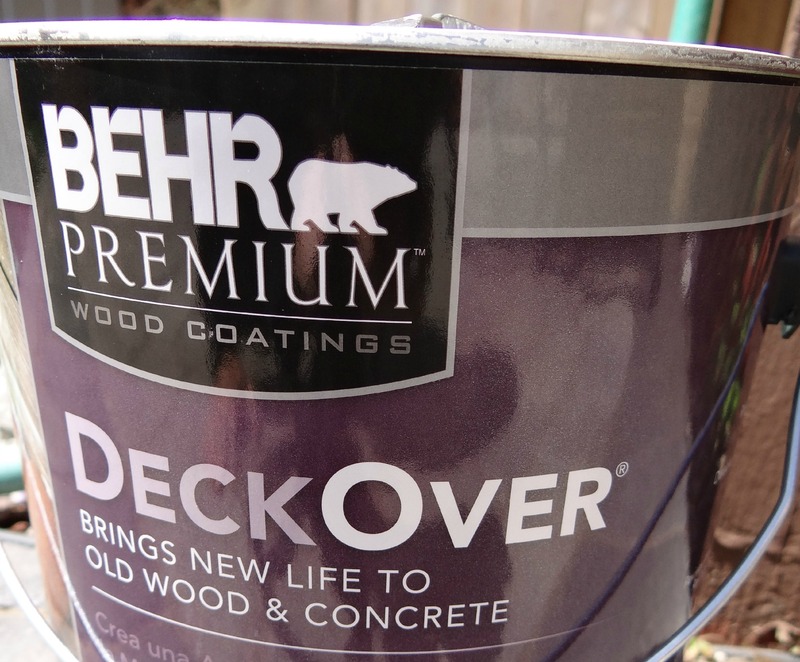 3) Behr’s Deck Over paint is a good buy! The color we chose is Padre Brown. 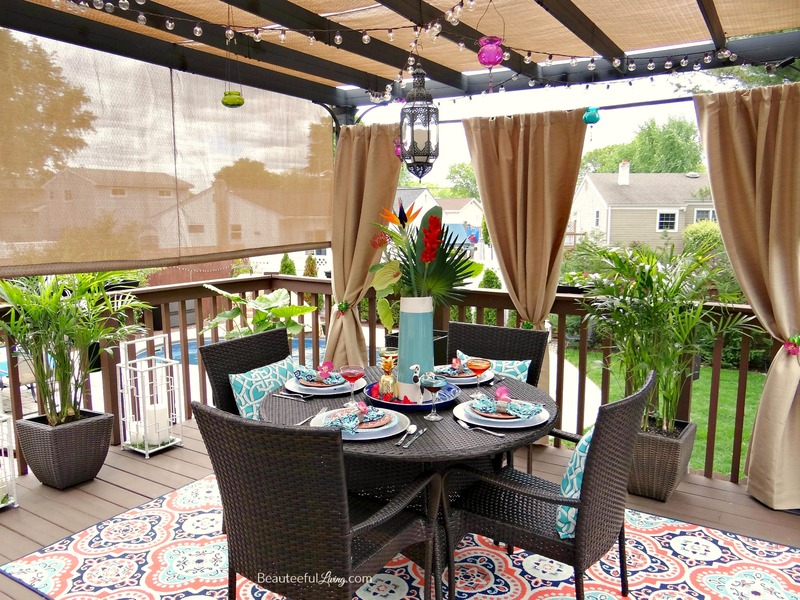 Stay tuned for upcoming Beauteeful Finds post on Outdoor Living. We are gearing up for Summer! Other than a couple of small strips on our deck floor, all paint remains in tact. Those sections are very small and fortunately not very visible. Looks like it’ll be a good idea to keep a small can of DeckOver paint on hand for future touch ups. 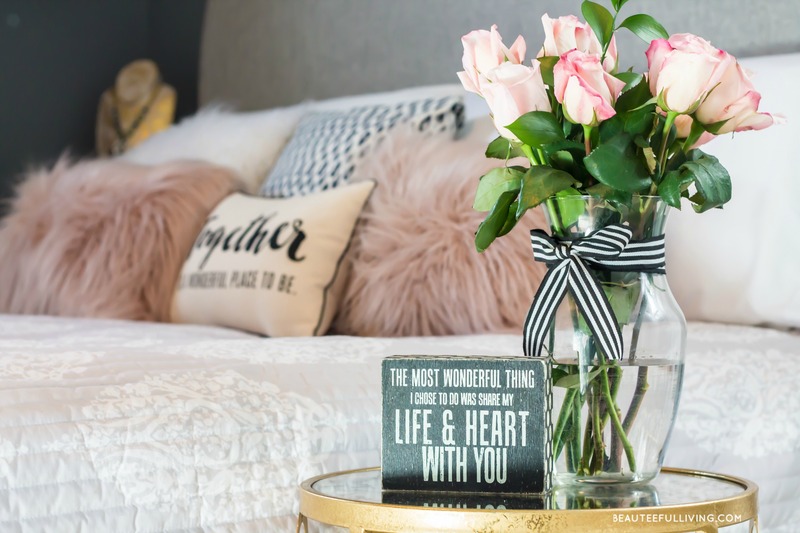 See all the details in post HERE. Looks good! What’s the name of this color? Thanks. oOOOH. It turned out great! I like the color. Thanks! Definitely impressed with how this paint covered the “weathered” sections of wood.